Voyager 3 is unlike any other book. David Darst’s essays are extraordinary prose poems, revealing the author’s overwhelming breadth of knowledge. He unleashes a flood of complex associations that connect everything from the world of a fighter pilot to his trek in Marco Polo’s footsteps through the Khyber Pass and along the Karakoram Highway. –John Snyder, sculptor and author of Hill of Beans, a memoir. David Darst is renowned in the global financial community as an investment strategist and author of seven books and scores of articles in his field. But he is also a relentless explorer—of places, people, ideas, experiences sensory and emotional; a devotee of the arts and sciences; a polymath. With Voyager 3, he merges these personae in a passionate and poetic guide through literal and imaginative landscapes. Voyager 3 takes its name and impetus from the two space probes, Voyager 1 and Voyager 2, launched by NASA in 1977 and now the furthest human-made objects from Earth. Darst begins his voyages with insights into the nature of space and space travel, his writerly pathways and influences, and the extraordinary magic of the 457 known moons in our solar system. Around these lunar pilgrims, Darst launches indelibly evocative prose poems delivering feelings, places, activities, and conditions of the mind and soul. Accompanying each moon-titled section are photographs intended to spark deep meditation and discovery. At times literally, at others metaphorically connected to the words, every photograph opens doors into Darst’s imagination. Close looking at each image affects interpretation of the text—and vice versa—adding layers of richness, texture, and meaning. Read one, read several, and experience their propulsive and satisfying intensity. David Darst shares the passion, knowledge, and wonder that launch astronauts into the realm of space and poets into flights of language. To that, he adds the very rare ability to bring science and art together in a vehicle for the reader’s own virtual voyage through the wonders of our Earth. An interesting, beautiful, and unusual book by a sensitive and gifted man. –Barton M. Biggs, Founder and Former Chairman, Morgan Stanley Investment Management; Founder and Managing Partner, Traxis Partners; Author, Hedgehogging; Wealth, War, and Wisdom; and A Hedge-Fund Tale. 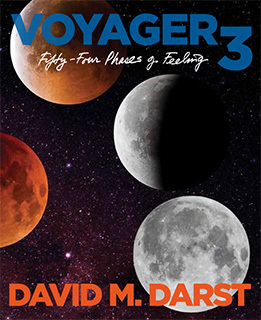 David Darst is Morgan Stanley’s globe traveling investment master, but in Voyager 3 we discover he is something else: a world class wordsmith, observer, embracer and lover of life. He takes us along on his personal journey exploring the limitless possibilities of human emotion, expression, creativity, and observation—a trip you won’t want to miss! David M. Darst, CFA is Managing Director and Chief Investment Strategist of Morgan Stanley Smith Barney, with responsibility for Asset Allocation and Investment Strategy; he was the founding President of the Morgan Stanley Investment Group. A highly energizing television personality and speaker, Darst is also the author of seven other books: The Complete Bond Book (McGraw-Hill); The Handbook of the Bond and Money Markets (McGraw-Hill); The Art of Asset Allocation, Second Edition (McGraw-Hill); Mastering the Art of Asset Allocation (McGraw-Hill); Benjamin Graham on Investing (McGraw-Hill); The Little Book That Saves Your Assets (John Wiley & Sons); and Portfolio Investment Opportunities in China (Financial Times Press). Darst earned a BA from Yale and an MBA from Harvard Business School.